The other day I walked into a secondhand bookstore in the center and asked the owner if he had any copies of M.L. Estefania books, and he snorted in what only can be described as disgust. My request was so unworthy of his highbrow bookshop that he didn’t even answer me with a monosyllabic “yes” or “no”. Shelves upon shelves of fusty, crease-marked books, stretching to the back and up beyond my reach, and not one copy of M.L. Estefania! Second hand copies of tawdry romance novels, manifestos, historical tomes, garish Franco-era magazines, and not one copy M.L. 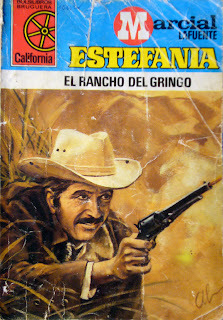 Estefania, the man singularly responsible for 3,000 western novels, who continues to produce even after his death (with his son now writing under his name). 3,000 novels and counting after a 64-year legacy, and where was his work, in this tomb of resurrected books? Marcial Lafuente Estefania was the son of a Spanish journalist and writer. In his youth he studied industrial engineering, and in the 1920s he visited the United States for work-related reasons. In the 1930s his work was interrupted by the outbreak of the Spanish civil war, in which he fought as a republican general. With the defeat of the republic he had the opportunity to escape, but he chose to stay in Spain, and it was the during his time in prison that he began to write on pieces of scrap paper. When he was released from prison he began publishing crime and romance fiction for a small editorial, but it wasn’t until 1943 that he published his first western, La Mascota de la Pradera, or The Pet of the Prairie. 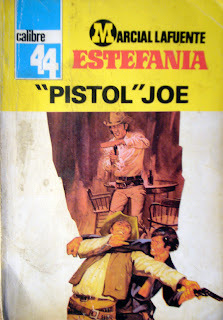 With this publication he became known for the “Estefania style” and as a skilled writer of the western genre, and this brought him a modest but important following. He dedicated the rest of his life to writing western novels. 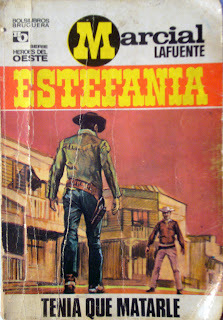 He began publishing with the Bruguera Editorial (alongside writers like Francisco Ibáñez, of Mortadelo and Filemón fame). 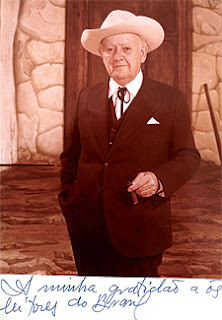 At a breakneck pace of one novel per week he continued turning out westerns – based partly on his experiences in the United States and on re-formulated plots taken from classic Spanish literature – until 1958, when his sons also began writing under the M.L. Estefania pseudonym. But, first they had to master Estefania’s style, which consisted of, “sentences full of challenges … of easy triggers, Colts and Winchesters shot at point blank, women of easy virtue and quarrelsome people that provoke the sheriff”. When they first started writing with their father they tried using more description – in contrast to Estefania’s trademark spare style – and people noticed. “That’s not Estefania,” they said, and his sons quickly had to adapt their style: less fluffiness, less elaborate descriptions and more action! 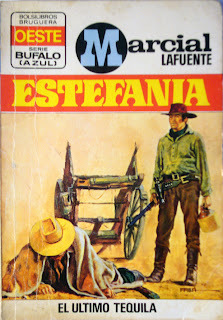 64 years later, with over 3,000 titles published, the Estefania legend continues. 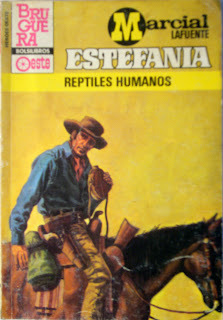 Almost all the books I’ve seen by Estefania are exactly 96 pages long, with barebones, action-packed and dialog-driven stories. One thing I’ve noticed is you can’t read them and look for deep meaning (if you do that, you will be extremely frustrated). Some of the stories are totally ridiculous, and lots of the time the plot will be shoehorned into a classic storyline and things will happen without any sort of explanation. What I look for when I read his stories are archetypes and style. The classic characters are all here, the fringe element, the frontiersmen, men of fortune and adventure, the noble and the wicked, the women of easy virtue, the conmen, gamblers and the righteous … It’s the romantic vision of the American wild west, through a European’s eyes. 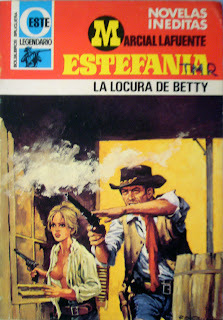 Interestingly enough, during Estefania’s publishing heyday in the 1960s, the best Spaghetti Westerns were being made in Spain, probably giving some of the most enduring – and attractive - impressions of that period of the United States. M.L. Estefania was easily part of this romanticizing movement. She looked at him, astonished. Sussie’s mind went ‘white like the snow’. She didn’t dare say anything. A friend of mine used to use the “Johnny Cash litmus test” on people, where he’d off-handedly ask whether someone liked Johnny Cash. “Yes” or “no” would decide that person’s friendship status. Take Estefania with you to a café, read his fictions of daring men and loose women, and observe people walking by. You can almost certainly tell what kinds of people you’re with by watching their reactions. Invite people to your house and watch their reactions to your strategically placed copy of Estefania on the coffee table. A snort of disproval or a word of appreciation will tell you much more about that person than a lengthy discussion of, say, Cortazar, where people usually dare not to disagree. To openly appreciate Estefania is un desafio, a challenge to the bookish elite. So, I pose the question: Hey guiri, hey artista, do you dig Estefania? You’ll see his pulp fiction classics in flea markets, in discount trays in front of secondhand bookstores for 50 cents a copy, every so often in the grimy hands of an old man sitting on a bench, but you’ll never see them in bookstores which hold a pretense to “high art”, or on bookshelves next to Calderón, García Márquez, or, for that matter, Cervantes. One day that’ll probably change when someone discovers him. Quentin? If you read this, it’s all you.